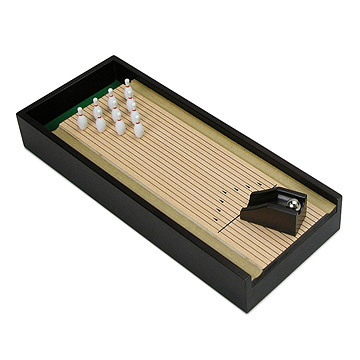 Bowl a spare between meetings with this desktop magnetic bowling table. It's funny how the small things pack the most joy. This miniature, magnetic bowling alley launches round after round of small victories as its tiny, metal bowling ball rumbles toward the pins. When you've settled the score, simply press the ingenious magnetic reset button, and watch the pins pop back up into place. Practice alone to hone your hotshot skills, or form your own tiny bowling league! Made in China. Not intended for children under 14. For 1-2 players. Gift for future son in law who can't stop playing with it! He's over 30! It's a hit. Loved this product. Quality was top notch. Design was thoughtful and has longevity. Purchased for a senior prom gaming area. Everyone enjoyed playing and with the magnetic points for the pins it made it super easy and user friendly. I got this for myself. I have it for family gatherings. The guests like it. Easy desktop game and very well made. The small bowling balls are easy to loose if you're not careful. Big plus that the base is magnetized under the pins, though it would help to have that on the other end too as the ball "launcher" moves a little when you "bowl". Easy to set, easy to play, just fun to have. I bought this for my 3 year old son to give to dad for Father's Day - the two of them had a great time. There is a magnet switch which makes setting up the pins super easy, then you turn it off to bowl. Great design, sturdy little product! Gave it to a friend of mine who has a high stress job. He loves it for those quick breaks where he can't leave the office but needs to break away and clear his head. It was donated as a gift. The recipient loved it and has praised its usefullness. Great gift! my coworker loved it!